Highchairs are great. Except when you don’t have one. That’s where the award-winning Totseat comes in. 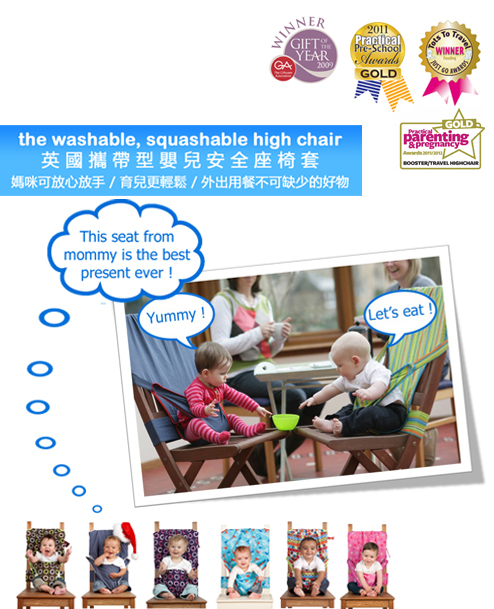 It safely anchors a tot (around 8-30 months) in almost any adult chair, like an instant highchair. Totseat can even be shortened or extended to fit chairs of varying heights, and its detachable cummerbund provides optional support on open backed chairs. Totseat is made of robust poly-cotton, so is fully washable, and comes in a range of funky fabric designs. It squashes into a bag and is really easy to use. Totseat's materials are sourced ethically, approved to Oeko-tex 100 Standard which pose no risk to health.